Opening a super shop business requires a great deal of investment. But if you are willing to make money your investment would not go to waste if you follow the few steps that I am about to share with you. One of the main factors is where you locate. Just like I said above opening a super would require you a lot of money. The location determines how fast and successfully your business may grow. It is very vital to locate your supermarket that can be easily accessed with high levels of traffic. Somewhere where there is an ample parking lot, and in a place where you do not have to compete with fewer or no supermarkets. Do not forget to attain your location’s license from the prescribed authority. Since you have decided to open up a super shop, you must not forget to market and advertise your shop. Here the advertising matters big time. Now is the time to create awareness within people. Open up a Facebook page. Make a blog of your shop, where you can put the price of your products and the discounts that you are providing. Other than online advertising, manual advertising is much more important. Make pamphlets start distributing them in your neighborhood. Put up pop-up banners with discounts offered for the for the first two periods or the decided period in order to get sales. These activities will be noticed by people and hence customer will visit the new super shop at least to have a look. You also invite your customers to your grand inauguration open ceremony, which can be headed by a celebrity. If that’s too expensive, you can avail contest for the customers where they could win themselves a prize. If you follow these ways your shop will be noticed and also you would get the customers to buy products from your shop. You have to have a business plan in your mind. Because trust me without a plan you will be going nowhere! Your business will have to contain a market analysis that deals with demographics and surrounding your super shop locations, the regular traffic around the stores, the prospects for profitability I your chosen location and financing requirements. You may also hire a consultant in case you are unsure of your plan. Since you are starting new a consultant would advise you well. Hiring. Once you are done with your location and business plan, it is time for hiring. You should train your staffs. This may cost you a little more but if you employees are not trained in customer’s service interpersonal skills, they may ignorantly chase some of your customers away. It is very essential that you train your employees on how to handle various categories of customers. Because you will be having all sorts of the customer in your shop. Arrange your shelves in such manner so that it would make your supermarket look tempting and attractive for customers. Also, arrange them in a way so that is easier for your customers to find stuff and help you are to monitor stocks and know how re-stock them. You can put up a large television this will get your customers attention more. When it comes to precautions there should be no limits. Put up CCTV cameras inside outside of your shop. Hire a reliable guard. 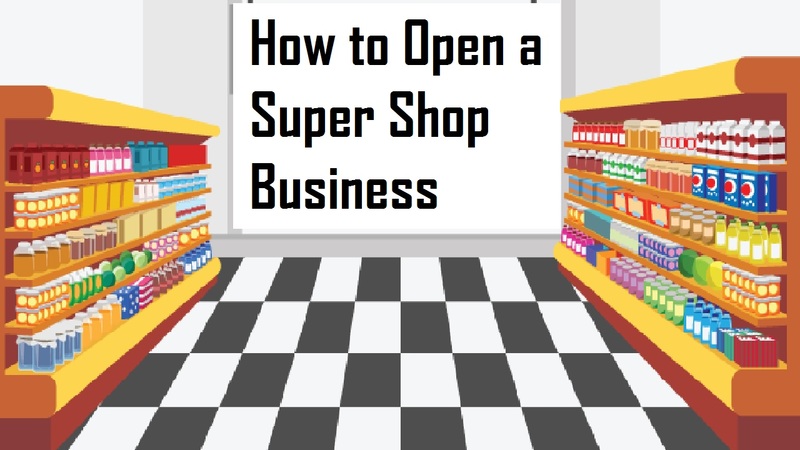 Super shop business includes a lot of ideas. Like choosing your supplier, registering the business, things which I mentioned above. It is like a long list which requires a lot of courage and a lot of techniques. If you think you have the potential do so, I would recommend you to just sit at home but start your planning, you are one-step ahead off of your dream.